The greatest Polish painter of the Young Poland movement, active in Munich and Paris. Born 1865, died 1940. Boznańska's first teacher of drawing was her mother, Eugenia Mondan. Later, in 1883-6, she was trained by Kazimierz Pochwalski and Józef Siedlecki as well as attending the Adrian Baraniecki Higher Courses for Women, where her teachers were Hipolit Lipiński and Antoni Piotrowski. In 1886-1889 she studied with Karl Kricheldorf and Wilhelm Dürr at the Munich Academy of Fine Arts. She developed her skills by copying works of old masters at the Pinakothek as well as Velasquez's paintings in Vienna. In Munich, where her mentors were Józef Brandt and Alfred Wierusz-Kowalski, she opened her own studio. In 1895 she took over – from Teodor Hummel – the management of his Painting School. In 1898 she settled down in Paris. Boznańska was a member of the Art Society of Polish Artists, Société Nationale des Beaux-Arts, Polish Society of Arts and Letters in Paris and the International Society of Sculptors, Engravers and Painters in London. 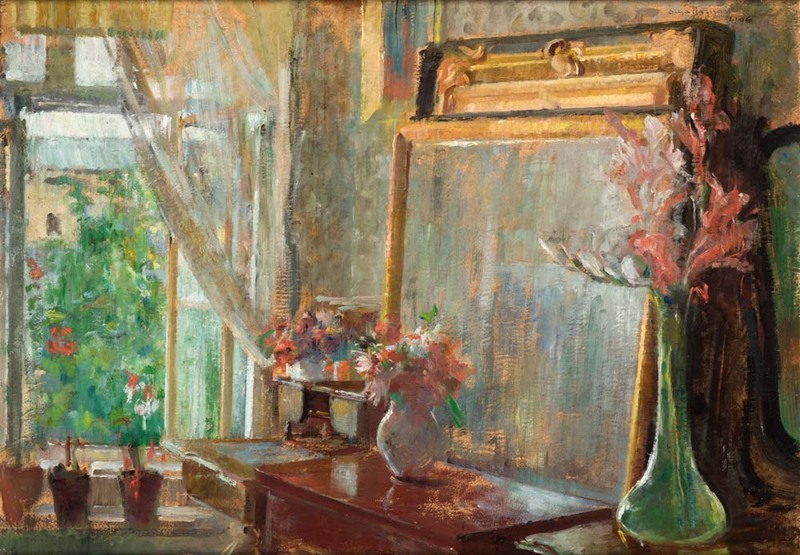 After she had first shown her works at Krakow's Society of Friends of Fine Arts, she exhibited her paintings at exhibitions in Poland, Europe and the USA, in particular in Berlin (1892, 1893, 1913), Munich (1893), Prague, London and Paris (1896), the Carnegie Institute in Pittsburgh (1901, 1906, 1907, 1920-28), Vienna (1902, 1908), Amsterdam (1912) and Venice (1910, 1914, 1938). She was a recipient of numerous awards, including the gold medal at the international exhibition in Munich (1905), French Legion of Honour (1912), Grand Prix at the Expo Exhibition in Paris (1939) and the Order of Polonia Restituta (1938). Boznańska's art was greatly influenced by the refined paintings of James McNeill Whistler and the free way of painting by Edouard Manet and Wilhelm Leibl, artists combining realism with impressionism. During her Munich period she made large-format full-length portraits (Portrait of a Boy in a Gymnasium Uniform, ca.1890; In the Conservatory, 1890). It was then that she defined the range of her palette, narrowing it down to dark colours dominated by browns, greens, grays and black, with white and pink serving as counterpoints. Her themes included still lifes and interiors, an odd landscape and – predominantly – portraits, many of them true masterpieces. The original portrait formula developed by Boznańska and revealing the influence of Whistler's intimate portraits falls within the expressive modernist portrait trend (Girl With Chrysanthemums, 1894). Her paintings focus on the models' faces, conveying both their emotions, the mood of the moment, and the traits of character. She paid particular attention to hands (Portrait of Painter Paweł Nauen, 1893). Boznańska's mature works, in which dress and interior are painted with looser paints, emphasize the spirituality of her models. De-materialized and ethereal, they are psychologically expressive. The dynamic brush strokes and vibrant colours produce the effect of narrowing and flattening of space; the in-blending of the figures of the models intensifies expressiveness (Portrait of Feliks Jasieński, 1907). Boznańska's portraits include images of both adults and children, people solemnly posing or lost in thought. A special place is taken by the artist's self-portraits, revealing the passage of time and its impact on Boznańska's facial features (Self-portrait, ca. 1906-7). Boznańska's Paris period produced a number of masterly sketches of people in interiors. Their mood of intimacy, melancholy and concentration is enhanced by the narrow range of browns and grays enlivened with spots of carmine and white. In turn, the painter's still lifes – some of them almost abstract, suggestive of the quiet existence of objects and the secret life of flowers (Anemones, 1901; Still Life With a Vase, 1918) – are characterized by the sketchiness of forms, nervous brush strokes, shimmering colours, sophisticated harmony of tones and skillful use of natural colours of the cardboard ground. Author: Irena Kossowska, Institute of Art of the Polish Academy of Science, 2002.